The peculiarity of sloths isn't limited to their appearance- they also happen to be a personification of the phenomenon of symbiosis (mutual gain from living together). Their strange fur is covered with algae (that serves as camouflage), and full of colonies of insects, beetles, and even moths. 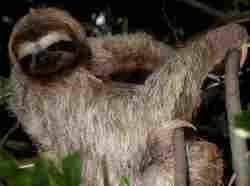 Sloths live in the canopy story of the rainforest. They are arboreal folivores, which means that they eat the young leaves at the tops of mature trees.